Does your bedroom need some sprucing up? 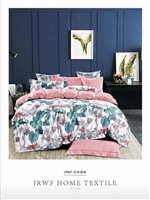 Here at Benson Australia, we offer you a stunning range of quilt covers to conveniently shop online, so you’ll find the ultimate bedding to suit your single, double, queen or king bed! When you buy Benson quilt cover sets, you can enjoy the convenience of 1 to 2 days’ shipment, the beauty of shopping online in Australia! Our versatile quilt cover sets are perfect for the whole family – so everyone will be sure to find something they like.